Screw Counter - No screws overlooked! Compact design with built-in driver controller and counter. Screw counter for up to 99 screws, depending on the work piece. Displays the remaining screw count each time you drive a screw. Buzzer sounds when a screw is overlooked or when all screws have been driven. 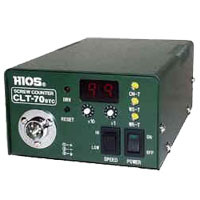 Count timer prevents double counting of screws tightened for conformation or for the second time. Controls external devices connected via 24V DC terminal. Prevents drivers from being activated by mistake. You can activate a driver only while jig holds a workpiece. Workpiece-set timer presets the time required for setting and fixing a workpiece with jig. Workpiece-reset timer presets the time required for releasing a workpiece from jig when all screws have been driven. Connectors for connection with multiple power supply units for sequential operation of multiple drivers. Screw driving while idling a push-start type electric driver, or repeated on and off operation of a driver in a short period of time may result in malfunction of this equipment. Please contact your dealer should such operation be needed.